ZAYTSEVE, Ukraine -- It used to take Vadym two hours to drive to see his relatives in east Ukraine but now the journey involves days waiting in the freezing cold at government checkpoints to leave rebel-held territory. Chaos and corruption on demarcation line in east Ukraine. The miner, 37, had camped out for two days with his wife and seven-year-old son in their ageing Lada car -- joining hundreds of vehicles queued up on one of the country roads leading out of the pro-Russian fiefdom separatists have carved out. 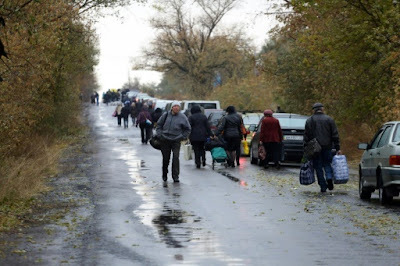 "There are no facilities here, no toilets, no stores, no lighting", Vadym complained to AFP at the Zaytseve checkpoint. "The queue is barely moving." After some twenty months of conflict the journey between the two territories appears to only be getting tougher. To relieve themselves travellers have no other choice but to scamper into a narrow strip of forest next to the rutted road -- risking stepping on landmines that now dot the countryside. After losing all hope of a quick victory over rebels, who Kiev and the West says are armed by Moscow and backed up by Russian troops, Ukrainian authorities last year decided to close the 500 kilometre (310 miles) dividing line -- establishing a de facto border. Kiev set up a system of checkpoints and special passes to regulate transport in and out of the area that has put tight restrictions on travel for local residents and drawn criticism from the United Nations. The United Nations Office for the Coordination of Humanitarian Affairs claims that these restrictions "isolate" people of the East, divide families and "limit the access to social benefits, medicines and humanitarian aid". In a bid to improved the situation the authorities introduced electronic passes earlier this year but for those waiting in the long queues that snake from the dividing line nothing seems to have changed. There are still only five functioning checkpoints to cope with a population of some three million still estimated to be living in the rebel-held territory. "It's true, there are people who have already spent two nights here. But it doesn't depend on us, we work fast and round the clock. The number of checkpoints is simply not enough," said Ukrainian border guard Oleg, refusing to give his surname. Standing on the different sides of the demarcation line, Ukrainian troops and pro-Russian rebels impose order on their respective sides. But when it comes to the no man's land in between, a strips of territory of almost 2 km (1.3 mi) wide, there is only anarchy. Disputes and fights occur constantly as some travellers struggle to one way and others battle to go by in the other. Anna, a housewife from the rebel capital Donetsk, had her windshield damaged when she used her car to block the road to stop other cars trying to hop the queue. "Why do I have to let those who are simply richer go by me?" she asked resentfully. "People who overtake others can pay between from 200 to 500 hryvnias (7 to 10 euros) to bribe the soldiers on the checkpoint." "The authorities have installed these checkpoints on purpose to make money," she fumed to AFP. Ukrainian border guards have set up a hotline for people to call if they witness anyone bribing their soldiers for a quick way through but civilians says this is not enough and have started taking matters into their own hands. Tatyana, 31, clasped a thermos of coffee in her hands as she inspected the vehicles trying to bypass the traffic jam to ensure that their passengers really have the right to skip the wait. Certain categories of people -- those with disabilities, couples with small children and journalists are allowed to pass without having to stand in line. But even this energetic woman admitted that the situation is almost impossible to control. "Here, it is a true anarchist republic," she sighed.